There are so many uses for an antiseptic, antibacterial, anti-tumor oil. Collect needles and twigs of any aromatic evergreen: cedar, juniper, hemlock, spruce, pine. You will also need a bone dry jar, some olive oil, and a label or two. Fill the jar very full of evergreen needles and twigs. You may leave them whole or cut them. Make sure their uppermost tips are well below the top of the jar. Fill the jar to the top with pure olive oil (or other oil of your choice). It is best if there is a “head” of oil floating over the evergreen. Cap well. Label, including date, on front and top. Place jar in a bowl to catch overflow. Ready to use in six weeks. Preparation time: With precooked burdock, 15 minutes at the most. Add another 45 minutes to soak and cook burdock. Serves 6-8. Soak and parboil burdock root or stalk. If you use chilled, already cooked burdock, warm it. Heat oil and butter. Add burdock, then garlic and herbs. Stir and heat together for a minute, then add tamari and lemon juice. Serve hot. A quart of this in the freezer guarantees hearty winter soups in half the time. Save the ends from your vegetable preparation for a week, excluding cabbage-family plants, and you will be ready to make this tasty broth, with perhaps only the purchase of a bunch of parsley. Combine all ingredients in a saucepan. Bring to a boil. Tightly cover, reduce heat, and simmer for 2-3 hours. Cool. Refrigerate or freeze. Should make at least 2 quarts of broth. Susun Weed and granddaughter Monica Jean focus on dried linden flowers and leaves. Linden infusion is a leading cold remedy. The simplest pesto is green leaves pounded with salt and garlic. I don't put cheese or nuts into my pestos when I make them, as these ingredients spoil rapidly. I use a mini-size food prep machine for the "pounding". A blender will work too, but watch that you don't burn out the motor. The oil in a pesto both preserves the antioxidant vitamins in the fresh green herbs and also softens the cell walls so minerals become more available. With the added health-benefits of garlic, herbal pestos are great medicine as well as superb eating. Stays good for up to two years in a cool refrigerator; up to five years in the freezer. • Start with half a cup of extra virgin olive oil. • Add 2-4 coarsely chopped cloves of garlic. • Add a good sprinkle of sea salt. • Add a large handful of prepared herb leaves and blend. • Continue adding leaves and oil as needed. Perhaps more garlic and salt? Blend. • When all is blended to a fare thee well, pack your pesto into a skinny jar. • Leave some space between the pesto and the top of the jar and fill this with olive oil. • Cap, label, and refrigerate. A caller on blogtalkradio says her 3 year old has a rash or eczema on her nose. She's tried a salve but it's not helping. Susun says to try just plain olive oil or coconut oil and direct healing energy to the area. This audio is just over 3 minutes in length. A caller on blogtalkradio, asks about circulation, what to do to to help cold fingers and toes. Those stick-in-your-hair-and-on-your-dog-and-on-your-sweater-too burdock burrs hold a wealth of seeds revered for their medicinal powers. Many plants have seeds that are easier to harvest than their roots, but burdock is not one of them. Digging first year roots (not yet) is hard work, but getting at the seeds is stickery prickery work. For details on exactly how to handle the seed heads and how to make Burdock Seed Scalp Tonic, please check out the burdock section in Healing Wise. A caller on blogtalkradio asks what remedies she can use for Hayfever. 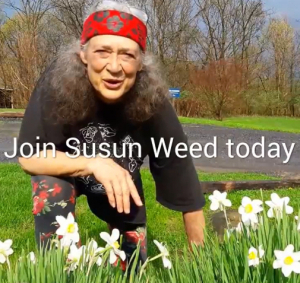 Susun talks about tree pollen, and why people have reactions to plants. She suggests Osha tincture while having the allergic reaction and tells a story about how Osha worked for her Aunt. This audio is just over 5:00 minutes long.